Small but perfectly formed. This lovely Small Island Unit has a bit of everything, deep cupboards, drawers even a row of wine bottle holders, with one end open with a slatted base, perfect for baskets. 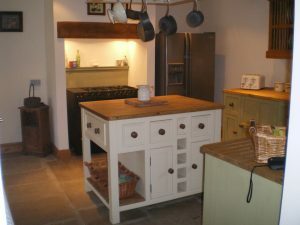 This island has been painted in our ever favourite tallow (farrow and ball) with a stained and waxed 27mm pine worktop (which is then treated with our waterproof wax so making it durable), and matching knobs on doors and drawers. If you wish to upgrade to a 40mm oak worktop please add £147.Delivery is included within 250 miles,please note there is some assembly required and this is not included.